Gauge: OO ; 16.5mm, Scale: 4mm to 1ft. Hazel Valley is a layout loosely based on railway practice and operation on the Hope Valley line between New Mills South Junction / Gowhole Yard and the city of steel, Sheffield. Parallel to the main line are exchange sidings for the freight traffic and a branch line that winds its way under the main line to serve the nearby limestone quarries and cement works and a small market town. A steam-era coal train passes the siding complex and will soon rattle through Hazel Valley Station. Scenic details portray the nature and tranquillity of the Peak District which is only disturbed by the passing of trains and the bleating of sheep. Trains depicted cover the London Midland region of British Railways practice of the mid 1960’s and our operating sequence will show different classes of steam locomotives and early British Railways diesels. Most trains pass by, but occasionally certain trains call at Hazel Valley station as part of the stopping passenger service along the route. Diesel prototype D0280 “Falcon” in green livery on a test train. 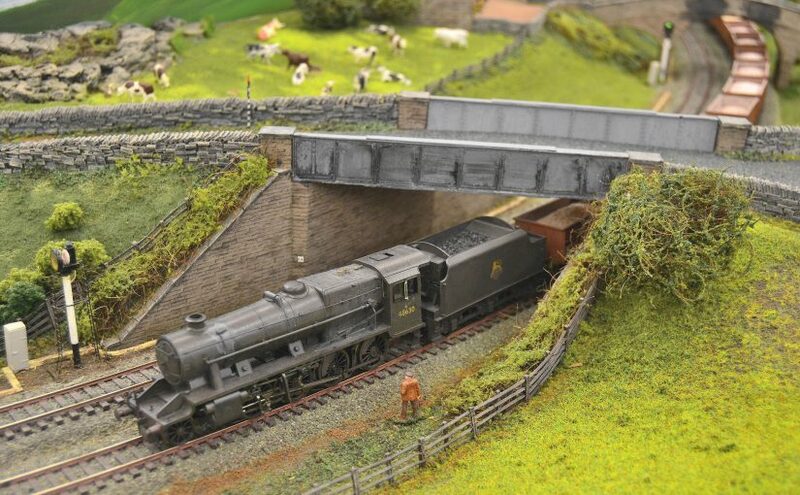 You can bring your loco’s and rolling stock and run them on this large and impressive layout. Please note the rule that, in order to qualify to run your models, you must arrive early enough to help to put the layout up as well as stay to help take it down at the end of the session.